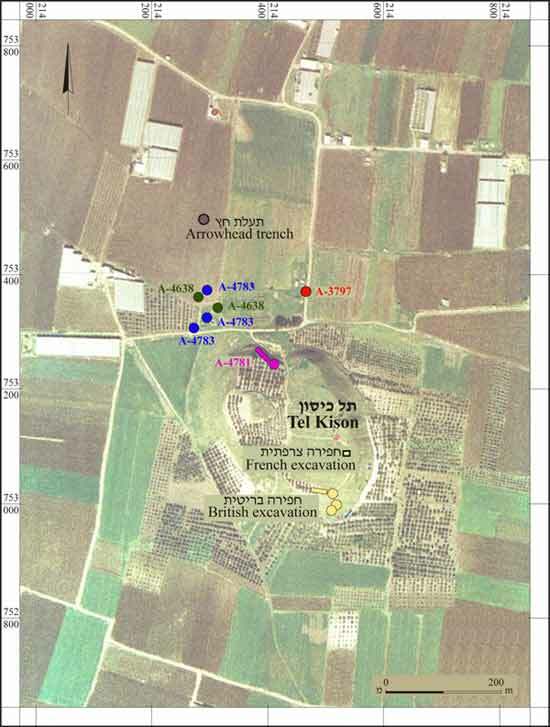 During November–December 2005, a salvage excavation was conducted north of Tel Kison (Tell Keisan; Permit No. A-4638; map ref. 21400–25/75340–50), as a result of damage caused to antiquities. The excavation, undertaken on behalf of the Israel Antiquities Authority and underwritten by the Israel Electric Company Ltd., was directed by N. Feig, with the assistance of Y. Lavan and Y. Ya‘aqobi (administration), A. Hajian (surveying), H. Smithline (field photography), L. Porat (pottery restoration), H. Tahan-Rosen (pottery drawing), G. Finkielsztejn (amphora stamps), H. Khalaily (flint artifacts) and E.J. Stern (late period pottery). A preliminary report of this excavation has been published (HA-ESI 120). However, due to unforeseeable reasons, the final report of this excavation appears hereafter. Tel Kison (60 dunams), is located 8 kms southeast of ‘Akko in the heart of the Zebulun Valley plain (Fig. 1). The tell was excavated by A. Rowe in 1935 (Rowe A. 1936. Tel Keisan. QDAP 5:207–209). Extensive excavations at the tell were carried out by a French delegation in the early 1970s (Briend J. and Humbert J.M. 1980.Tel Keisan [1971–1976]. Paris). A more recent excavation was conducted north of the tell in 2002, exposing three strata from the Persian, Hellenistic, and Mamluk–Ottoman periods (HA-ESI 119). A section was carried out along the southeastern slope of the tell, revealing Early Chalcolithic and Bronze Age strata (Permit No. A-4781; Abu Hamid, per. comm. ), while remains of a Persian structure, an assemblage of Hellenistic pottery and a Roman road were excavated in 2006, 400 m north of the tell (HA-ESI 122). The settlement at Tel Kison had begun in the Neolithic period and lasted until the second century BCE. It included a large Early Bronze settlement, a Middle Bronze II fortified city and a wealth of Iron Age residences. Presence of imported vessels during the Iron Age indicates commercial connection with Mediterranean cultures, whereas the importance of the Persian and Hellenistic periods is indicated by the plethora of amphorae from the Mediterranean islands. After a gap of several centuries, a Byzantine church was founded on top of the tell and abandoned during the seventh century CE. Salah a-Din had put up his command post on the tell in 1189, during the siege of ‘Akko. Two areas (D, E; 5.0×7.5 m; HA-ESI 120, Fig. 1), 20 m apart, were opened north of the tell. Remains dating to the Early Chalcolithic period, Iron Age I–II and the Persian–Hellenistic periods were uncovered. This square consisted of soil accumulations that contained numerous fragments of pottery vessels from different periods. No architectural remains were uncovered, except for an undated stone wall segment in the southwestern corner. Four strata were identified. Stratum IV dated to the Chalcolithic period. 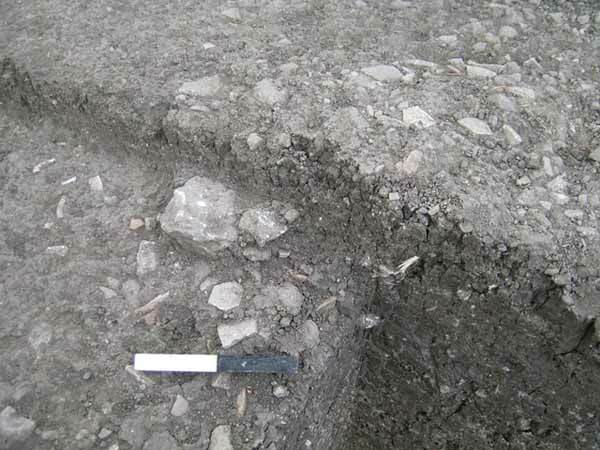 No architectural remains were discovered, but an accumulation layer (L415) near the line of stones (L414) and in the northeastern edge of the area contained jar fragments and flint artifacts, such as sickle blades, which are typical of the Chalcolithic flint industry. Below this stratum, a yellowish brown layer of alluvium devoid of potsherds, which is characteristic of this region, was exposed. Stratum III. 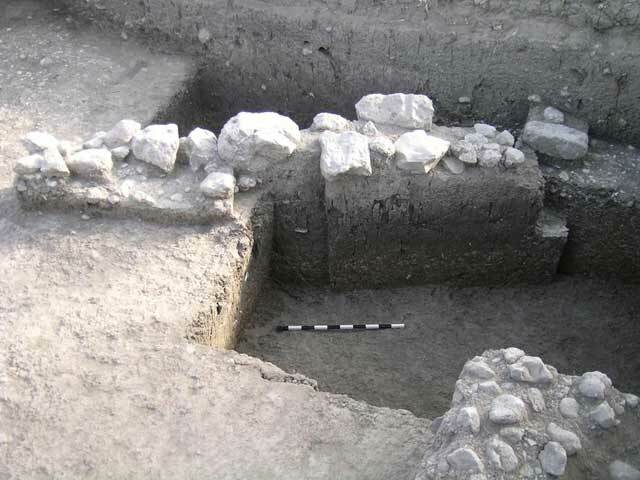 Iron Age was uncovered in the eastern part of the square (L407, L413). A section was cut into the Persian-period floor (L403; Fig. 4) and a floor (L413), composed of potsherds and small stones, upon which were a few Iron Age I–II broken vessels in situ, was found. However, in the northeastern corner of the square (L407), the Persian floor was dug into the Iron Age level, especially in the western side. Therefore, finds from the Iron Age (L407A) and the Persian period (L407B) were mixed together. Stratum II dated to the Persian period.A floor level(L403) was uncovered in the eastern part of the square, extending from the southern upper part of the slope to its northern bottom part; it consisted of potsherds and small to medium-sized stones, covered with a thin light layer of beaten soil. This floor clearly overlaid the Iron Age floor (L413) in the southern side of the square, yet in its northern lower part, Floor 403 was dug into the Iron Age level (L407). Floor 403 and the upper floor level in the northwestern part of the square (L405) were replete with all types of pottery vessels. Stratum I is the Hellenistic level, which consisted of a floor of large pebbles (L404) that survived only in the northeastern part of the square, although it probably covered the entire space. Fragmentary amphorae and jugs were exposed above this floor. However, cultivation activities over many years destroyed this stratum, causing the scattering of pottery vessels all over the area, and the mixture of potsherds from different periods on the surface. A single square (5.0 × 7.5 m, max. depth 1.5 m) was excavated, and a series of stone-paved levels and a wall (W31) were exposed. Four strata were identified above a deposit of a yellowish brown layer of alluvium (thickness 0.35 m), similar to the level in Area D.
Stratum IV dated to the Iron Age; a beaten chalk floor (L313, L324), which contained numerous potsherds dating mainly to Iron Age II, was uncovered. Beneath this floor and clearly observed in the balk section, a layer abounding with potsherds from Iron Age I and the Chalcolithic period was discerned. Stratum III dated to the Persian period and was composed of three layers. The bottom layer (IIIc; L314) consisted of small stones and potsherds from the Persian period. It was uncovered directly above the remains of the Stratum IV floor, probably reusing it. The second middle layer (IIIb) covered almost the entire area of the square. It was a thick floor layer (0.30–0.35 m) of potsherds and pebbles (L309, 310; Fig. 6) that contained a mixture of potsherds from both the Persian and Hellenistic periods, including a very rich repertoire of Persian mortaria bowls and jars, alongside Hellenistic amphorae and jugs that belonged to the upper Hellenistic stratum, which penetrated into the Persian floor. Floor 310 is attributed to Stratum III because of its similar elevation to other floors of Stratum III and the fact that the pottery in some parts of it was solely Persian. The other loci were securely dated to the Persian period. The third layer (IIIa; L317) was uncovered below the Hellenistic wall (W31) and in the northeastern part of the square (L307N). It was a pebble floor with smooth stones around it, maybe an open area (courtyard?). Stratum I dated to the Hellenistic period. 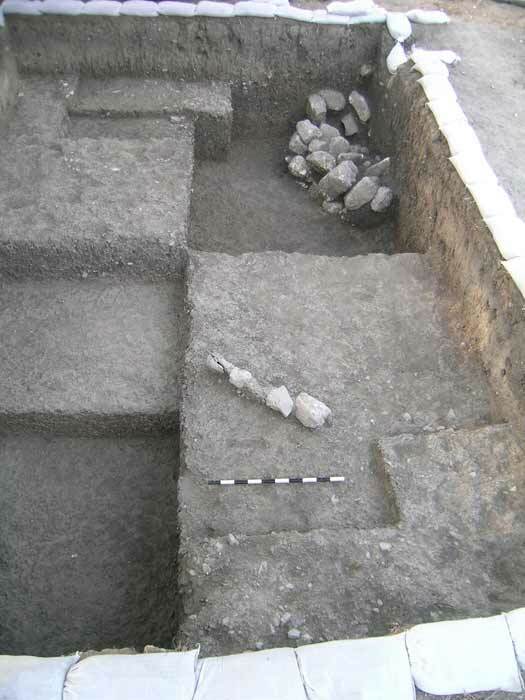 A floor of large pebbles (L301) was discovered in the southwestern part of the square, overlaying W31. Due to the disturbed character of the finds, some loci contained mixed potsherds. Late Bronze Age: No stratum was related to this period. A Cypriote milk bowl fragment was found in the bedding of the Persian Floor 307; it was probably eroded from the tell. Iron Age: The storage jar in Fig. 7:1 resembles a type that originated in the northern coastal region, i.e., Phoenicia (Sarepta and Tyre) and is the most common type in Tel Kison; it appears at the end of Iron Age I. The holemouth storage jar (Fig. 7:2) is attributed to Iron Age II; it appears from the end of Iron Age IIA and continues until Iron Age IIB. A torso headless fragment of a typical pillar figurine (Fig. 7:3) was found on the Persian Floor 307S. However, it is classified as Type AIII by Holland (T.A., 1977. 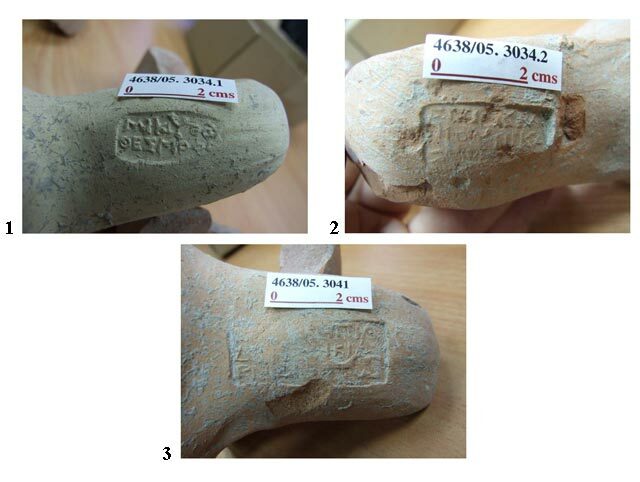 A Study of Palestinian Iron Age Baked Clay Figurines, With Special reference to Jerusalem: Cave I. Levant 9:137) and is dated to the Iron Age. Persian Period: A rich repertoire of this period was discovered in Stratum II (Area D) and Stratum III upper layers (Area E). The black-slipped bowl (Fig. 7:4) is an East Greek type of banded bowls, which was found also on the tell and is dated to the second half of the fifth century CE (Mook M.S. and Coulson D.E. 1995. East Greek and Other Imported Pottery. In E. Stern. Excavations at Dor: Final Report, Vol. IB [Qedem Reports 2]. Pp. 93–94). A large number of bowls in the Persian loci are mortaria (Fig. 7:5–7). This is the most common bowl in the Persian period; it is attributed to Stratum 4 at Tell Keisan (Briend and Humbert 1980: Pl. 31), Stratum VII at Tel Qiri (Ben-Tor A. and Portugali Y. 1987. Tel Qiri: A Village in the Jezreel Valley [Qedem 24]. Fig. 3:1–12), Tel Michal (Singer-Avitz L. 1989. Local Pottery of the Persian Period [Strata XI–VI]. In Z. Herzog, G. Rapp and O. Negbi, eds. Excavations at Tel Michal, Israel. Tel Aviv. Fig. 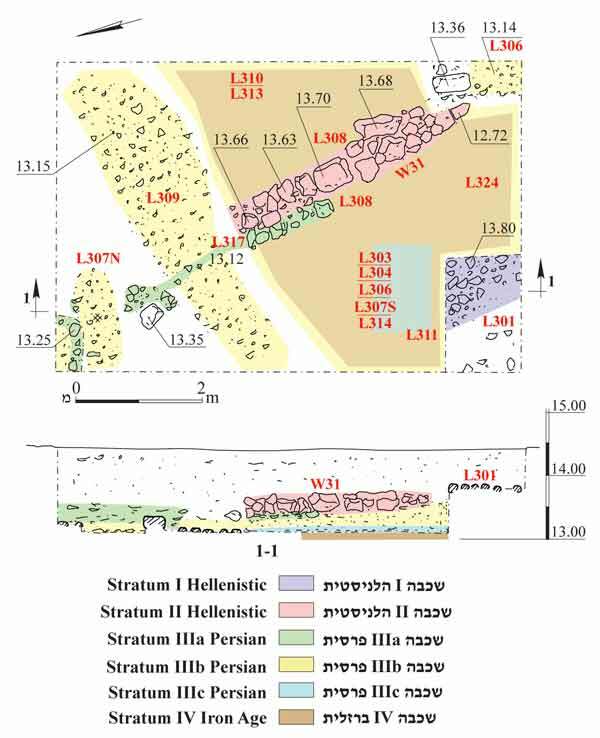 9.16:1, 2), and at Tel Dor; Stratum VII (Stern 1995: Fig. 2.2). At all these sites, this bowl is dated to the Persian period. Beside the krater(Fig. 7:8), which is a typical shape of the period, dozens of jars were found; the most common type is the flat-shouldered jar (Fig. 7:9–11), which prevails inStratum 4 at Tell Keisan, as well as in Areas D and E. This jar type was discovered at almost all the sites that contained Persian material in the Galilee and the coastal plain. The jar (Fig. 7:12, 13) that resembles Type F1 (Stern E. 1982. Material Culture of the Land of the Bible in the Persian Period [586-332 B.C]. Jerusalem, pp. 104–105) is a less common type and its distribution is limited to the coastal plain, the Sharon and the Galilee. The “basket handle family jar” (Fig. 7:14, 15) is confined to the Galilee and the coastal plain, but is known from the Phoenician coast (Tyre), Cyprus and Rhodes; it was probably used as a commercial jar in maritime trade during the Persian period. Hellenistic Period: The vessels from this period were found in situ on the floors in Stratum I (Area D) and Strata II, I (Area E). The red-slipped bowls(Fig. 8:1–5) are the dominant type at the site, as in other coastal plain sites. They include a bowl with incurved rim, hemispherical shape and pinched handles (Fig. 8:1), which is the dominant type at the site, as well as on the tell and at Tel Dor (Guz Zilberstein B. 1995. 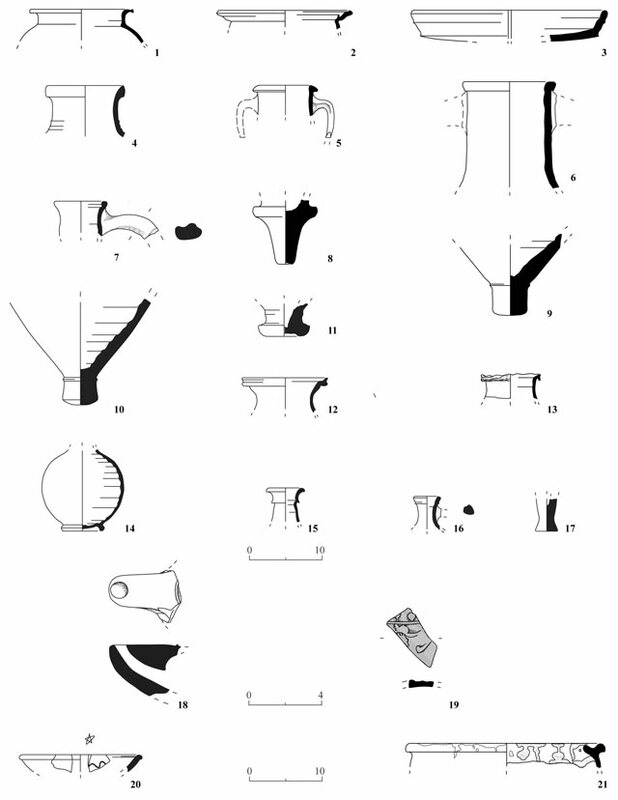 The Typology of the Hellenistic Coarse Ware and Selected Loci of the Hellenistic and Roman Periods. In E. Stern. Excavations at Dor: Final Reports Vol 1B [Qedem Reports 2]. Pp. 289–290, Fig. 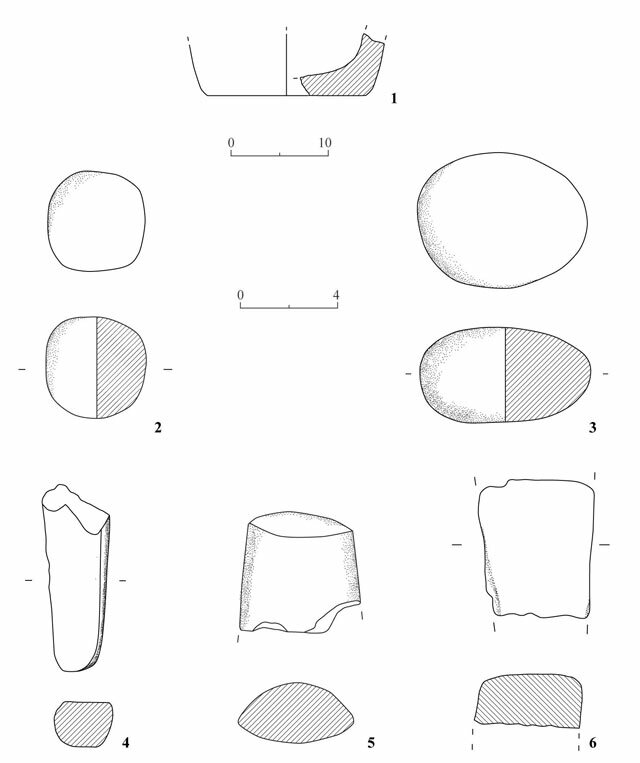 6.1:1–24); bowls with flat outturned rims (Fig. 8:2, 3) that are also red slipped, resembling ‘fish plates’, a bowl with molded relief (Fig. 8:4) and a deep bowl (Fig. 8:5) that belongs to the incurved rim family of bowls. Another bowl (Fig. 8:6) is made in the ‘west slope’ technique. The painted decoration of undulating ivy tendrils and leaves on the interior of the bowl is one of two different decorations that appear on this type, which is usually decorated with stamped palmettes in the center, and roulettes in the zone between them and the painted ornaments. Three different cooking pots were uncovered: Globular cooking pots (Figs. 8:7–10; 9:1); casseroles (Fig. 9:2); and baking trays (Fig. 9:3). These types are common to the second century BCE. The bag-shaped jar (Fig. 9:4) is the most dominant type in the Hellenistic period. It belongs to a long tradition of local and coastal pottery from the first half of the fifth century BCE until the first half of the second century BCE in Stratum 2 on the tell. The most prevalent form at the site is the imported amphora (Fig. 9:5–11). Only a few stamped handles were uncovered (see appendix). This type includes table amphora (Fig. 9:5) and a large group of Rhodian and a few Knidian amphorae. These amphorae have a high elongated neck and angular handles (Fig. 9:6, 7). The different pointed bases originated in Knidos (Fig. 9:8), Rhodes (Fig. 9:9, 10) and in Asia Minor (Fig. 9:11). All the amphorae are dated to the second century BCE. The high quantity of jugs (Fig. 9:12–15), an amphoriskos (Fig. 9:16) and ungentaria (Fig. 9:17) indicates the variety of the Hellenistic pottery at Tel Kison. Two different types of lamps cover the chronological span of the Hellenistic period at Tel Kison: Wheel-made Attic imported lamp (Fig. 9:18) from the beginning of fourth until the second half of the third centuries BCE and a red-slipped discus lamp (Fig. 9:19), which appeared in the first century BCE and is most common in Phoenicia, Syria and Palestine. Crusader and Mamluk periods: Only a few potsherds were found on the top of the Hellenistic floor levels. These included a bowl (Fig. 9:20) with a monochrome yellow glaze and splashes of green, and a decoration of gouged sgraffito with a wavy line design. This type is dated from the fourteen to the fifteenth centuries CE; it appeared in post-crusader assemblages and is absent from the Othman pottery repertoire. The second vase is a cooking pot (Fig. 9:21), with brown glaze,wide mouth and a gutter thickened rim that is dated to the second half of the thirteenth century CE. A few stone objects were found, includinga small bowl (Fig. 10:1) that was used for crushing small quantities, perhaps spices, as well as pounding/grinding tools, including a hammer stone (Fig. 10:2), a round grinding stone (Fig. 10:3) and cylindrical pestles (Fig. 10:4), which seem to have been usedas a pounding tool in conjunction with narrow deep mortars. The sharpening tools (Fig. 10:5, 6) were made of basalt. The Trapezoid tool (Fig. 10:6) has one flat and highly polished surface. The stone objects were uncovered in the Hellenistic strata, I in Area D and II, Iin Area E. Three different shells were discovered in the Persian and Hellenistic loci; they all come from the Mediterranean Sea and two of them have a hole, and could have been used as beads. 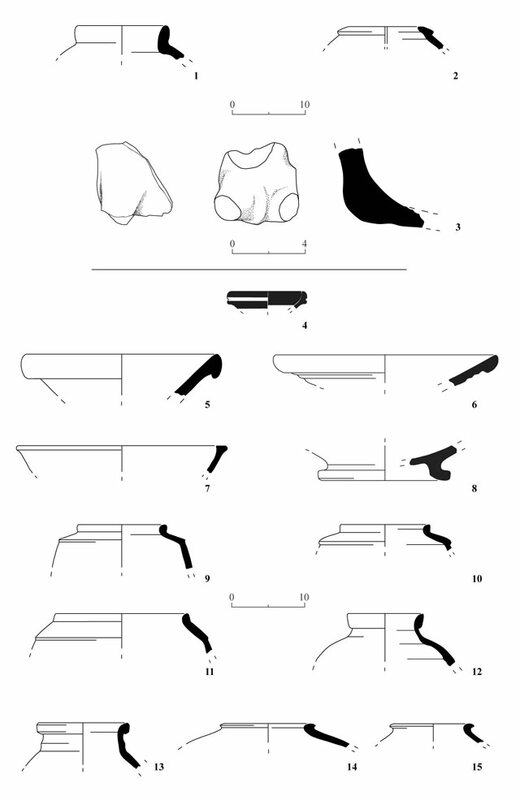 Although the excavation was limited to two squares, a considerable amount of flint was collected (N =48), but only four tools were identified. Apparently, the flints were locally produced from various raw materials, which are largely found in the immediate vicinity of the site. The majority of the artifacts displayed calcareous cortex on one of their surfaces, but without patina. Only two artifacts displayed double patina and could be related to Musterian flints. Most of the items were produced from medium quality raw material, which was a light gray and brown nodule flint, used for the production of flakes and flake tools. These nodules contained chalk inclusions that prevented comprehensive exploitation. Three cores were classified; they were shaped from large nodules, but were over exploited and had an amorphous shape. These three cores display small flake scars and were targeted for flake production, typically ad hoc knapping activities. The four tools included three sickle blades and one burin. One of the sickle blades is a fragment of a Canaanean sickle blade. Since the waste did not contain Canaanean products, we assume that this sickle blade reached the site as a final product. The other two sickle blades were shaped on short and thin blades. Both are backed and truncated. Such sickle blades are common to Chalcolithic industries. The burin is of dihedral type and was fashioned on a wide blank. 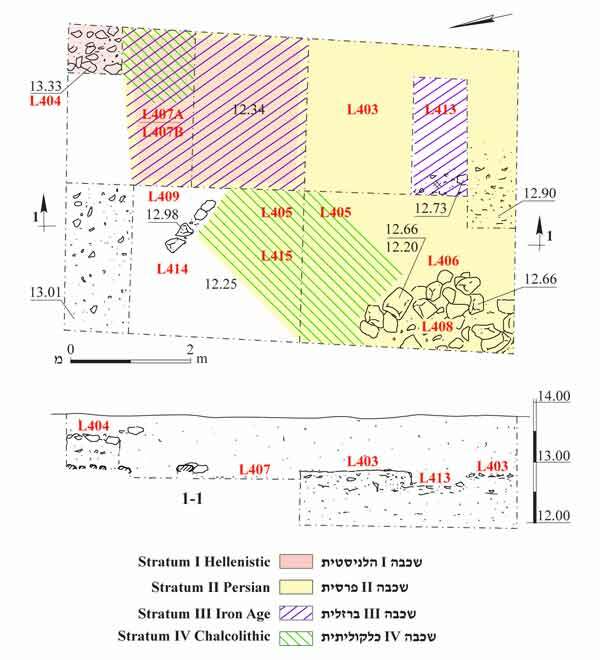 The few recovered tools (Area E, Stratum IV; Area D, Stratum III) show heterogeneity in the periods, as well as a high degree of mixture. This is somehow related to the location of the squares at the bottom of the slope, where items from several occupations were deposited. Despite the poor remains, floor levels were discovered at the foot of the tell. The few vessels on an Iron Age floor level dated to the end of Iron I and Iron II—a period of weakness and decline at the city. Iron Age Strata 8–6 on the tell also displayed poor construction and reused buildings of Stratum 9 (Iron Age Ib). Indications to that effect are described in the Bible, if Tell Keisan was indeed part of “the Land of Kabul” (1 King 9:11–13) and one of the cities given by King Solomon to Hiram king of Tyre. The Persian period included a few floor levels with a large number of pottery vessels, as well as imported East Greek vessels and stone objects, which point to activity at the foot of the tell near the fields. Notably, Stratum 3 on the Tell was also very rich with various types of pottery vessels. The Hellenistic occupation at the site destroyed part of the Persian floor levels and reused them. Attic ware and stamped handles of Rhodain and Knidian wine amphoras are evidence of strong ties with the archaic and classical Greek world and the Hellenistic world in general. The pottery vessels of the thirteenth–fifteenth centuries CE represent the end of the Crusader and the beginning of the Mamluk periods, yet they are insufficient to indicate any settlement at the site. 1. Tel Kison, aerial view. 2. Area D, plan and section. 3. Area D, general view to the south. 4. Area D, Persian floor (L403) above Iron Age floor (L413), looking southeast. 5. Area E, plan and section. 6. Area E, Hellenistic W31 above the Persian floor (L309), looking east. 7. Iron Age and Persian-period pottery. 9. Hellenistic and later periods, pottery. 11. Rhodian and Knidian Stamped handles.